Make new friends, explore Chicago and do a Mitzvah while you're at it. YLD and JUF's TOV Volunteer Network host a plethora of volunteer opportunities perfect for young adults who enjoy spending time with peers and giving back to the Chicago community by feeding the hungry, helping the needy, raising funds at our phonothons and so much more. 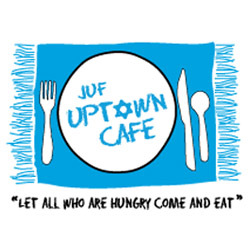 The JUF Uptown Cafe is Chicago's first kosher anti-hunger program for the needy. In addition to providing hot meals in a restaurant-style setting, the JUF Uptown Cafe brings dignity and hope to people in need. The JUF Uptown Cafe feeds Jews and non-Jews alike and is open three days a week for dinner and on Sundays for brunch. Get involved now! Volunteer Responsibilities: Volunteers serve food and are encouraged to enjoy a meal with guests, as many diners are socially isolated and in need of person-to-person contact. 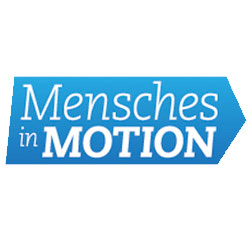 Mensches in Motion is an ongoing volunteer program that gives young adults the opportunity to make a difference at a variety of organizations with the same group of peers. Through this six session program, participants will also learn about and volunteer at JUF supported agencies and see firsthand the impact the JUF Campaign has on those in need. Projects include preparing and serving meals, working with children with disabilities, creating food packages and much more! Through this program, participants will meet other YLD-ers, make a difference in the community and learn how to get further involved with YLD/JUF. For more information on the program, please contact yld@juf.org. This program is co-hosted by the Young Leadership Division (YLD) and the Tikkun Olam Volunteer (TOV) Network. Feed Chicago brings young adults (age 22-40ish) together on one day to volunteer at a variety of organizations throughout the Chicago area. Projects take place on a Sunday in the spring and fall and consist of preparing and serving meals, delivering food packages, sorting warehouses and much more. Participants not only make a difference in the community, but also enjoy socializing and meeting other YLD-ers. This program is co-hosted by the Young Leadership Division (YLD) and the Tikkun Olam Volunteer (TOV) Network. 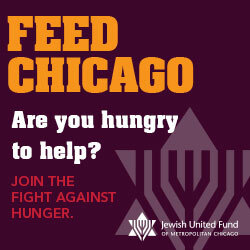 Feed Chicago is part of the JUF Hunger Awareness Project.